Asked to comment on the election of Donald Trump, Canadian Prime Minister Justin Trudeau said he's not going to be "shy" about the fact he's a "proud feminist," believes "immigration is a source of strength" and "Muslim Canadians are an essential part of the success of our country." 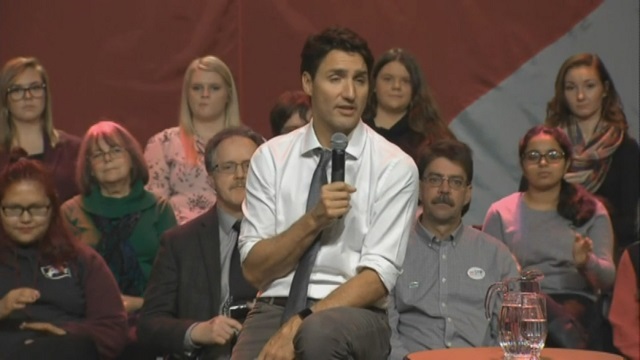 "Canada is a separate country from the United States and there are things we hold dear that the Americans haven't prioritized," Trudeau said at a town hall event Thursday in Belleville, Ontario. "And I'm never going to shy away from standing up for what I believe in, whether it's proclaiming loudly to the world that I am a feminist, whether it's understanding that immigration is a source of strength for us and Muslim Canadians are an essential part of the success of our country today and into the future."